The Old Walled City of Shibam is one of the earliest and most perfect examples of vertical construction. Shibam, nicknamed "The Manhattan of the Desert", was built on a hill to escape the floods of the wadi Hadramawt. The highest house is eight stories high, 29.15m. The average height is five stories. 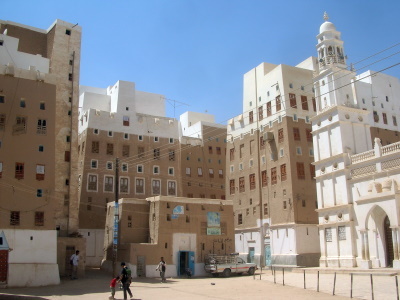 Most houses date from the 16th century, when Shibam was recovering from a severe flood. 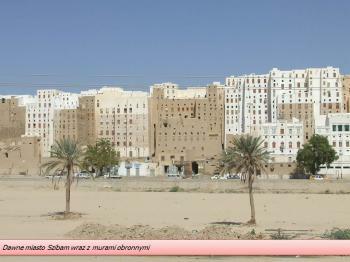 Shibam Hadhramaut, called Manhattan of the desert... In the middle of the desert, with some palm grooves around, you can experience something really unexpected: 8-, 10-stories clay buildings, all brown with white geometrical ornaments. The oldest ones were built in 10th century - but according to the local law any new house built inside the city walls must follow the old pattern. There a small museum in Shibam and it is possible to visit some houses. Just ask around, and they let you in. This starting point of visiting Shibam Hadhramaut (there's another Shibam close to Sana'a) can be Sayyun or for a very long day trip - Al Mukkalla. Sir Wilfred Thesiger: His travels there in the 1940s are described by Thesiger in "Arabian Sands" . "Whenever I was in the silent alleyways under the sheer walls of these houses I felt as if I were at the bottom of a well"